This is what happens when you gamma-irradiate a scowling, Sicilian meathead. All-around handsomeness. 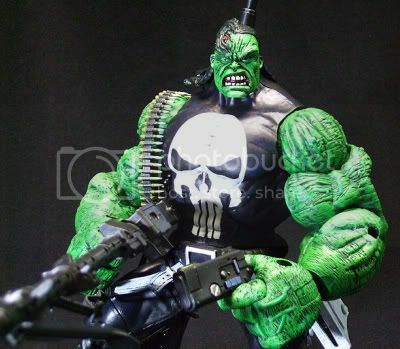 The Hulk doesn’t need firearms any more than Christian Bale needs a bad case of ‘roid rage, but nevertheless, the minds and hands at custom-toymaker Boskoes Toys have posted on Ebay this one-of-a-kind Punisher Hulk action figure based on the Marvel Legends line of toys. Wasn’t quite sure if we should call him a Punisher Hulk, or a Gamma Infected Punisher. Either way, he’s one mean green action figure- hyper detailed paint, and a crazy arsenal of muscle, guns, and poppin’ veins make him stand out on any shelf- a one man army ready to wreak havok on the rest of you collection. Man. I’m pretty sure toy collectors and people going to the movies to see ultra-crappy comedies are the only ones propping up the economy. So, to the toy nerds and to the tasteless: America thanks you. Next post: Geek Steal: At Least 45% off Joss Whedon TV DVDs!